At Bedford Children's Center, our focus is on managing the care and development of our students, as well as supporting families in their own journeys. We know how tough it is to balance work and family. We want you to consider us your partner in that process. We work to foster warm and loving relationships with both you and your child, and to provide an environment that encourages creativity, learning and fun. We want your children to learn, to grow, to create friendships, to feel safe and welcome, and to have positive experiences every day. As members of the Bedford community, we also know the importance of nurturing relationships with our fellow businesses and community leaders, families, and even alumni! 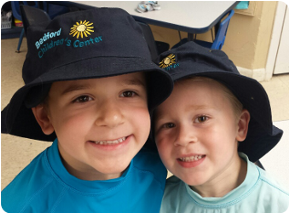 BCC is part of the warm and friendly atmosphere that is created by the families that live and work here in Bedford.